Pianist and composer Eddie Palmieri is one of the pioneers of latin-american and afro-cuban jazz. One of a kind! Known as one of the finest pianists of the past 60 years, Eddie Palmieri is a bandleader, arranger and composer of salsa and Latin jazz. His playing skillfully fuses the rhythm of his Puerto Rican heritage with the complexity of his jazz influences: Thelonious Monk, Herbie Hancock, McCoy Tyner as well as his older brother, Charlie Palmieri. Born in Spanish Harlem and raised in the Bronx, Palmieri learned to play the piano at an early age, and at 13, he joined his uncle’s orchestra, playing timbales. Palmieri’s professional career as a pianist took off with various bands in the early 1950s including Eddie Forrester, Johnny Segui’s, and the popular Tito Rodriguez Orchestra. In 1961, Palmieri formed his own band, La Perfecta, which featured an unconventional front line of trombones rather than the trumpets customary in Latin orchestras. This created an innovative sound that mixed American jazz into Afro-Caribbean rhythms, surprising critics and fans alike. Palmieri disbanded La Perfecta in 1968 to pursue different musical endeavors, though he would return to the band’s music in the 2000s. Palmieri perfected his arranging skills in the 1970’s releasing several impressive recordings that reflected his unorthodox approach to music. In 1975, Palmieri won the first-ever Grammy for Best Latin Recording for “The Sun of Latin Music”. He’s won ten Grammys altogether to date, including two for his influential recordings with Tito Puente, “Obra Maestra/Masterpiece”. In addition to the Grammys, Palmieri has received numerous honors throughout his career. In 2015, Palmieri released a new Big Band version of his classic composition, “Vámonos P’al Monte”, along with the first ever studio recording of another popular Palmieri original, “Pa’ La Ocha Tambo”. Further releases followed: “Mi Luz Mayor” (2016/17) with Carlos Santana and Gilberto Santa Rosa, “Sabiduria/Wisdom” (2017), and “Full Circle” (2018). 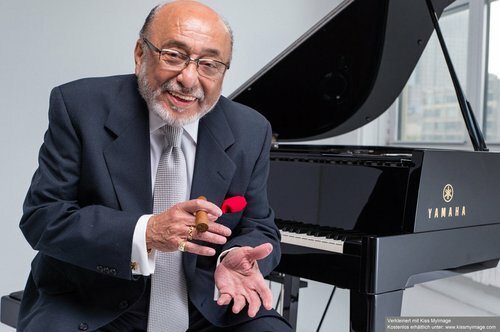 Eddie Palmieri celebrated his 82nd birthday on December 15, 201802.04.-06.04.2019 Eddie Palmieri Sextet and continues an active touring and recording schedule.